This criticism may be one reason a relatively large share of Muslims neither identify with nor lean toward either party. Indeed, U.S. Muslims are twice as likely as the public overall to say they lean toward neither major political party (20% vs. 9%). Earlier this month the Runnymede Trust launched a new report, Islamophobia: Still a challenge for us all, to mark the 20th anniversary of the publication of the landmark 1997 report, Islamophobia; A challenge for us all. The significance of the original Report is hard to over-estimate. While it is the case that it did not coin the term Islamophobia, it certainly gave it legs. And while it is also true that the report did not end Islamophobia, it did indict it. Recent attacks in Paris, Beirut and Baghdad linked to the Islamic State in Iraq and Syria (ISIS) have once again brought terrorism and Islamic extremism to the forefront of international relations. According to newly released data that the Pew Research Center collected in 11 countries with significant Muslim populations, people from Nigeria to Jordan to Indonesia overwhelmingly expressed negative views of ISIS. One exception was Pakistan, where a majority offered no definite opinion of ISIS. The nationally representative surveys were conducted as part of the Pew Research Center’s annual global poll in April and May this year. In no country surveyed did more than 15% of the population show favorable attitudes toward Islamic State. 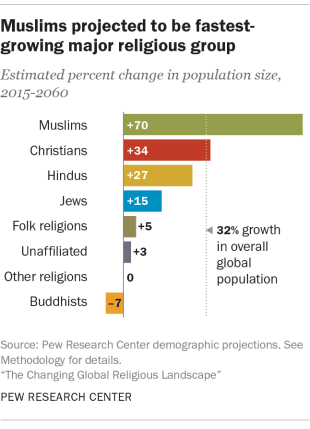 And in those countries with mixed religious and ethnic populations, negative views of ISIS cut across these lines. In Lebanon, a victim of one of the most recent attacks, almost every person surveyed who gave an opinion had an unfavorable view of ISIS, including 99% with a very unfavorable opinion. Distaste toward ISIS was shared by Lebanese Sunni Muslims (98% unfavorable) and 100% of Shia Muslims and Lebanese Christians. More than a year after the first stirrings of the Arab Spring, there continues to be a strong desire for democracy in Arab and other predominantly Muslim nations. Solid majorities in Lebanon, Turkey, Egypt, Tunisia and Jordan believe democracy is the best form of government, as do a plurality of Pakistanis. Indeed, these publics do not just support the general notion of democracy – they also embrace specific features of a democratic system, such as competitive elections and free speech. A substantial number in key Muslim countries want a large role for Islam in political life. However, there are significant differences over the degree to which the legal system should be based on Islam. The United States is not seen as promoting democracy in the Middle East. In newly democratic Tunisia, only about three-in-ten believe the American response to the political upheaval in their country has had a positive impact. Despite the tumult and uncertainty of the last year, views about democracy are mostly unchanged since 2011, although support has declined somewhat in Jordan. Enthusiasm for democracy tends to be generally less intense in Jordan and in Pakistan. It is consistently strong in Lebanon and Turkey.